As Fredericksburg’s HVAC experts All Air Heating & Cooling is dedicated to improving the quality of your air for an improved quality of life. And while we specialize in AC and heating systems, we also offer solutions to keep your air perfectly humidified through the driest months of the year. In this blog, we’ll discuss some of the benefits of having a professional-grade humidifier attached to your HVAC unit. Sinuses can’t function properly if they’re too dry—they are much more prone to blockages, poor drainage, and infection. For those who suffer regularly from sinus problems, a humidifier could be the answer, as increased humidity will help increase the flow of sinus secretions, stave off infection, and improve overall sinus health while keeping your sinuses properly lubricated. If you’re a snorer (or if you sleep next to one), you know that a dry throat can be the difference between an endearing hum and a symphony of snores. Using a humidifier throughout the night can moisturize the throat and sinuses, leading to a less piercing snoring noise and a deeper, healthier sleep state. Even if the snoring still keeps you up at night, you can rest assured that your partner is sleeping soundly. Waking up with dry, crusty skin and chapped lips can become a painful nuisance, especially in the cooler, drier months of the year. Adding a humidifier to your home, and running it through the night, can alleviate some of the skin problems caused by dry air, helping your skin stay supple and retain moisture so you can feel and look healthier. Plus, a little moisture won’t hurt your hair either. Recent scientific studies have shown that increasing the humidity level in your home to above 43 percent can curb the effects of a large number of airborne viruses, as many airborne bacteria become too heavy to float through air when exposed to increased levels of moisture. This is perhaps the biggest benefit of adding a humidifier to your home—increased humidity can help you stave off the spread of illnesses like influenza. Without enough moisture in the air, wooden objects like doors, molding, furniture, and cabinets can warp, crack, and break entirely. Low humidity is even a leading cause in the splitting of wood floors. Turning up the humidifier will keep your wooden objects moisturized so they can retain their shape and function, protecting them from damage in the driest months of the year. Static electricity can be an annoyance when it comes to your laundry and your hair, but it can also cause damage to electronic devices. Using a humidifier will add moisture to the air that can completely prevent some of the effects of static electricity, and keep your hairstyle intact. 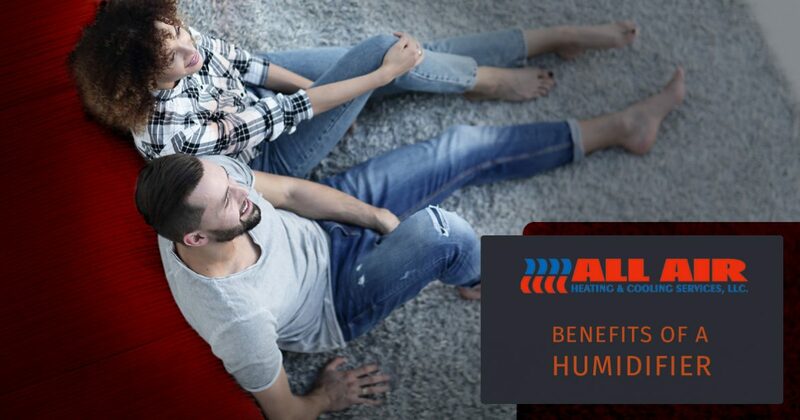 All Air Heating & Cooling takes advantage of some of the best humidifier technology in the industry to help you and your loved ones stay healthy. Get in touch with us today to learn more about humidifier installations!